To thicken the sauce later,you will need one tablespoon cornstarch mixed into 2 dl water, one tablespoon honey, one teaspoon of teriyaki sauce. Heat up a wok with 1 tablespoon of oil and stir-fry the chicken meat until the color turns white or half-cooked. Dish out and set aside to wait. Add another 1 tablespoon of cooking oil into the wok and add in the bell pepper,cellery,and onion. Stir-fry until you smell the peppery aroma from the bell peppers and add the chicken meat back in. Add in the Sauce and stir continuously until the chicken meat is cooked and well coated with the sauce. Add salt to taste, if you like. Add in the cashew nuts and sugar snap peas,and do a few quick stirs. 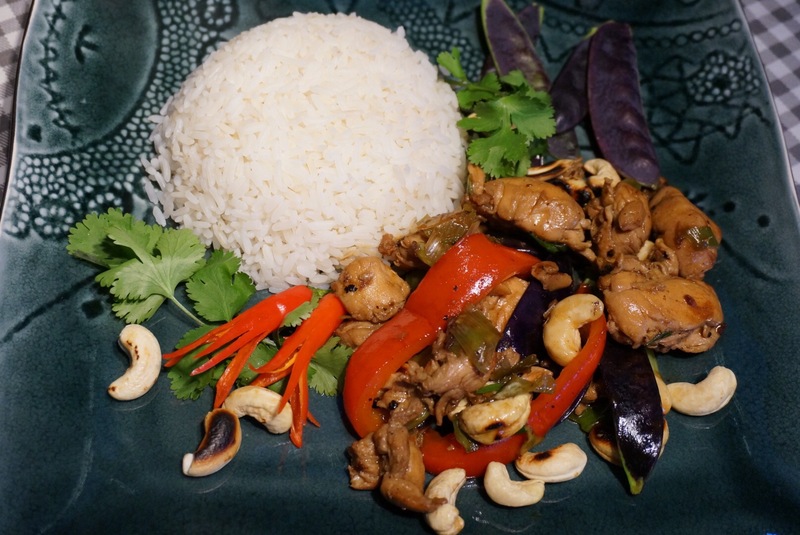 Dish out and serve the Cashew Chicken hot with steamed white rice and cilantro. Note: If you want some kick into this dish,add chili peppers. I usually have separate dish with chopped up chilies on the table from where everybody can add chili according to their taste. Next Post Laskiaispulla.. Shrovetide Brioche Finnish way.. Mouth watering! Chicken is so versatile ingredient for so many yummy meals. I’ll be saving this one. You make them even better with your photos!